by Jane Kaye, Susan McGibbons, Catherine Heeney, Michael Parker and Andrew Smart. Oxford: Hart Publishing Ltd., 2012, 370pp. Paper $90. ISBN 978-1841139050. Reviewed by Michael Yesley, JD, former director, Program on Ethical, Legal and Social Implications of the Human Genome Project, U.S. Department of Energy. Email: myesley [at] earthlink.net. Collections of biospecimens and genetic data, commonly known as biobanks, have become a major biological resource but have also raised concerns about the risk of inappropriate use of the col¬lected materials. In response to these concerns, a variety of privacy, human research, and ad hoc regulations have been imposed on biobanks, and scholars have produced a sizeable literature from the perspectives of ethics, law, and social science. Since 2007 at least ten books about biobank governance have appeared in English, of which the one reviewed here is the most recent. Unlike its predecessors, this volume is not focused on analysis of issues mainly in the abstract, but describes and analyzes the actual experience of persons involved in the operation of biobanks, on the receiving end of the governance measures. It provides a useful empirical addition to the theoretical commentary. My only criticism is a reader's lament that the multi-authored book could have been organized more concisely to reduce repetition. 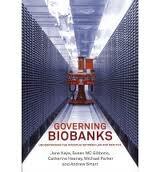 Although the title "Governing Biobanks: Understanding the Interplay between Law and Practice" implies a comprehensive account of biobank governance, this report of a multidisciplinary research project (mainly law and sociology) carefully restricts its scope to the time and place studied – England and Wales from 2005 to 2009, "a time when biobanks were starting to proliferate but there was no clear or dedicated framework as to how they should be governed" (p.28). (With apologies to Scotland, the region studied is called "UK" herein.) The research analyzed the biobank governance officially mandated in extensive legal and other documentation, and compared it with the governance actually experienced by 49 boots-on-the-ground creators, managers and users of UK biobanks, as reported by them in semi-structured interviews. The research results are interesting and certainly useful for policymaking in the UK, but less directly applicable elsewhere and somewhat dated. This is an unavoidable consequence of concentrating on the UK's version of a complex regulatory apparatus that varies significantly in other countries and is constantly evolving with advances in genetic science. Still, the research has important lessons for any biobank regulator and is a model for policy research about extra-scientific issues that often accompany developments in science. The field of bioethics commonly targets such issues in medicine and the life sciences, sometimes relying more on empyreal [*579] principles than empirical data. Fortunately, the fact-based study under review avoids this problem, hewing closely – for the most part – to systematic analysis of governance authorities and survey responses. As for principles, the study aims no higher than the pragmatic goal of effective regulation. To set the complex scene, biobank is a "radically contested concept [that] defies any easy definition" (p.54). The researchers found 59 terms denoting collections of genetic data and/or physical biospecimens that may be categorized as "biobanks." These terms refer to a diverse assortment of public and private genetic collections – in pathology labs, newborn screening repositories, crime data¬bases, academic and pharmaceutical research labs, etc. – reflecting advances in genetic science, increased sharing of genetic materials among institutions, and evolving political, social and ethical sensitivities. The governance of biobanks responds – or attempts to respond – to these sensitivities, focusing on matters such as protecting the privacy of donors of genetic materials, obtaining consent to use their materials in research, the fairness of studying populations that will not benefit from the research, the extent of any obligation to inform donors about subsequent findings, and ownership of biospecimens. Instead of a dedicated framework of biobank governance, the project's documentary review identified "a wealth of legislative enactments creat[ing] a complex, overlapping, yet uncoordinated and (paradoxically) incomplete statutory system" (p.62). As in the US, "the regulatory framework for biobanking cannot be detached from the general framework governing medical research" (p.67). However, in contrast to the regulations for the protection of human subjects in the US, there is "no overarching legislation govern[ing] medical research involving human participants in the UK" (id.). Surprisingly, the project found that research ethics committees (RECs), despite their lack of formal authority in the UK, "exercise by far the greatest measure of control over biobanks, essentially, through acting as medical research 'gatekeepers'" (p.77). This important role of RECs in the governance of UK biobanks is not mandated or even indicated by the formal governance documentation, and the discovery of this de facto role demonstrates the importance of the survey arm of the research project. Further, this surprising finding raises the question whether a proposed revision of the human subject regulations in the US (Department of Health and Human Services 2011) that would exempt much research involving biobanks from their current oversight by institutional review boards (IRBs) would eliminate an unduly burdensome control as intended, or would squander a potentially useful resource. In addition to the gatekeeping role of RECs, the project identified many other informal guidance and oversight structures that do not appear on any formal map of biobank governance, including "requirements imposed by leading biomedical research funding bodies . . . internal institutional oversight systems . . . biobanks' or projects' own steering, scientific, ethical or other such committees or boards . . . professional [*580] and social networks. . . and the de facto power of 'trailblazers' to become, by default, norm-setters or standard-setters, especially in the absence of clear rules or regulations on point" (p.138). These findings lead to the conclusion that the effectiveness of biobank governance cannot be judged solely on the basis of laws and appointed officials, but must also take into account the informal mechanisms and unofficial overseers. The role of RECs, though significant, is not entirely salutary, which will not surprise critics of IRBs in the US. The complaints of respondents in the survey of persons involved in the operation of UK biobanks are familiar in the IRB world: the RECs are seen as "overly bureaucratized, time-consuming, costly, duplicative, wasteful, increasingly stringent, overly protective, distant, out-of-touch, remote from communities and researchers, lacking in adequate knowledge and expertise, inconsistent and often ineffective" (p.176). "[R]espondents endorsed in principle the need for biobanking activities to have ethical approval. However, three major concerns . . . were bureaucratic wastefulness, RECs lacking knowledge, specialization and/or expertise . . . and inconsistency" (p.183). Despite these criticisms, the UK survey respondents saw much to be gained from biobank governance, primarily to confirm the legitimacy of their activities and also to spell out clearly what they need to do to resolve social and ethical issues. The respondents saw biobank governance as a reassuring response to public sensitivity about genetics, "provid[ing] a confirmatory device or symbolic badge of 'appropriateness'" (p.210). This finding, too, calls into question the proposal in the US to reduce the role of IRBs in overseeing research involving biobanks. Eliminating the burdens of IRB review might lose, at the same time, the public reassurance of accountability provided by review. The report includes a chapter on ethical issues, including the challenge of obtaining donors' consent to use their genetic materials when the research is unknown at the time of donation and re-contacting the donors for their consent when the details become known would be impracticable. A general consent permitting use for any future research would not be fully informed, though it might forestall future objection. The UK report suggests resolving this issue with a consent agreement to permit use of the biospecimens for any research "overseen by a suitably constituted data-access committee" (p.291). This issue has long been avoided in the US by treating de-identified genetic materials as exempt from the human subject rules, including the informed consent requirement. The proposed revision of the US rules would eliminate this exemption on the technical ground that all biospecimens are unique and therefore potentially identifiable (no matter how difficult and unlikely this would be). Having raised the regulatory bar by requiring consent, the revision would then knock it to the ground by accepting general consent, which one commentator has described as "nothing to do with informed consent, it's just getting a signature" (Clayton 2012). Finally, the report compares the empirical research findings with principles of "good governance" and "better regulation" enunciated in UK [*581] statutory law (p.310, fn.18). Against these standards – encapsulated in the rubrics of consistency, transparency, accountability, targeting (on the problem, with minimal side effects), proportionality, and public participation – governance of biobanking in the UK has "important shortcomings" and "room for improvement" (p.317). On the other hand, a "notable finding" of the project was the sense of responsibility expressed by researchers at biobanks: "the importance placed on moral practice by researchers themselves is without doubt one of the key factors in the establishment and maintenance of high ethical standards in research" (p.323). This finding, of course, raises the question how elaborate should governance of biobanks be in response to generalized concerns about privacy and consent but no evidence that biobanks are operating unethically – an interesting question for another project, another book. Clayton, Ellen Wright. 2012. "Do We Really Want Biospecimen Exceptionalism?" [video file]. Retrieved from http://www.law.harvard.edu/media/2012/05/18_pf18.mov. In Cohen, I. Glenn, and Holly Fernandez Lynch, eds. Forthcoming. The Future of Human Subjects Research Regulation. Cambridge: MIT Press. Copyright 2012 by the author Michael Yesley.